In some of my sessions with CAMHS, our therapist has suggested ways in which I can help Mini verbalise some of his feelings, as it’s something he struggles with. The therapist thinks that part of the reason behind his meltdowns is frustration – and we can see that sometimes if we don’t react quick enough (to Dollop standing in front of him when he’s watching tv, to her snatching a toy from Mini or to him getting frustrated with cutting up a sausage) a meltdown can quickly erupt – Mini won’t tell us, or alert us to the situation, he won’t ask for help, he’ll just explode –toddler style- and have a tantrum, but fortified with extra added rage. So the therapist’s suggestion is to say things like ‘I can see you’re getting frustrated because Dollop’s in the way, let me ask her to move’ or ‘You’re getting cross because you can’t cut up the sausage’. I’ll be honest, this is what we’ve tried to do from day 1 with both children to help them understand and name their feelings. Dollop is already able to name a few of her feelings – basics like happy and sad. Mini can name feelings if he sees different faces, he can read other people’s faces and body language reasonably well, but if you ask him how he feels he’s nearly always happy. Sometimes he’s ‘really cross with you daddy’, but mostly, even when we can see he’s upset, he’s happy. So, seeing as we’ve always done this, I’ve probably become a bit slack because after 4 years with no change it all started to sound so false. It also very often antagonises Mini. He gets cross and disagrees with the words we’ve used, but can’t tell us why they’re wrong, or what the right word is. Sometimes, the disagreement ends up being the start of another rage. But, Mini has to learn how to express himself in a non-aggressive way, he can’t continue attacking people when he experiences a challenging emotion…he needs to be prepared for grief, relationship breakups, disappointment, road rage even, so I’ve started in earnest again and it’s kind of working. I empathised and told him that I could see that was what he really wanted, but we only get presents on our own birthday. I explained that he was lucky enough to get lots of presents on his own birthday when Dollop didn’t, but that today is her day. I had no choice but to divert Mini’s attention here. The conversation could have very quickly spiralled into another meltdown, we were on the cusp of it anyway, and the wailing was beginning to intensify. So I explained that we only had 10minutes to get ready for school, perhaps he could go and brush his teeth and get changed, then we’d be able to get going. After all, it was also his friend’s birthday and we had to take her card too. Anyhow, I’ve digressed. With a bit of an educated guess, and some empathy, I was able to find out what was really bothering Mini. I’m not 100% convinced it was all about the presents, but even if it wasn’t, at least the empathy from me, and the release of emotion from Mini was enough to calm him. This last week has been tough for Mini – he’s had a class assembly in which he (along with the rest of his class) demonstrated what they’ve been learning, then the surprise of a weekend away with Nanny and Grandad, followed by Dollop’s birthday (and the excitement of keeping a secret as he knew what we’d bought for her!). It’s not surprising we’ve had difficult bedtimes, wet trousers on the way home each day, a couple of wet beds and a few hyper days. But this week, more than ever, the NC and I have been tuned into what might be triggers and difficulties for Mini. We’ve been able to empathise more. And we’ve been able to help him name those feelings when he’s not had the words. Are we on the right track now? I'm really glad to read this... it gives me hope that eventually we'll get there. Admittedly boy-o is only 3 and a very young 3 at that. We do the empathy thing 'I think you are upset because of x...' but he'll say 'No, not' whatever! 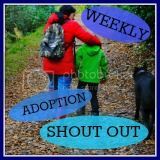 Stix, I've really been enjoying reading your blog posts, having come across your blog in a search for more adoption blogs. My husband and I are getting close now to adopting our first child, and I have gradually been moving towards reading more blogs about adoption, rather than the fertility blogs I have read for years...it's an interesting transition to make and one that's increasingly rewarding. Reading about the real life experiences and challenges of adoptive parents has also been incredibly useful, so thank you. I was also really interested in your post about being both a adoptive and then a birth mum, and how you wondered where you fitted in. I hesitated to put myself fully in the 'infertile' group because, perhaps naively, I just couldn't seem to give up the idea I'd be a birth mum one day (being still relatively young at 32 and having no actual conclusive evidence that we can't have a child of our own, just five years of trying). Even though our social workers have suggested we grieve this unknown chapter of our lives, I have a funny feeling that it isn't quite yet the end of our journey. Who knows what the future holds? What will be, will be. For the time being, we are just ridiculously excited about becoming adoptive parents! Anyway, I look forward to reading more of your adventures and experiences. It is indeed an interesting transition - and there's a whole load of new terms to learn- BM, BF, FC, SW and PAS to name just a few, rather than TTC, BFN etc of the infertility forums/blogs. Good luck on this next stage of your journey. Although times with Mini are tough, challenging and unexpected, and pregnancy held it's own troubles and challenges, we wouldn't change our family for the world. These days, I never say never as anything -it seems- is possible! (For the record, you're the same age as me! ).